Hi Todd. First, welcome to the club. You will find this to be a wonderful place for info and help. I am in the process of restoring a 410S for a good friend of mine. 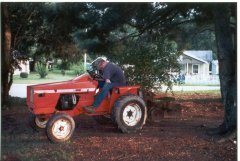 I am using DuPont Fulthane paint that I had color matched to Ace Hardware Allis Chalmers Orange. The cream color I had matched to Rustoleum Antique White. The DuPont paint is a much better paint. It can be hardened with a hardening agent. Also another club member, Paul Friddle aka debshirl, has an excellent set of decals that he can get for the 300 and 400 series. Good luck.